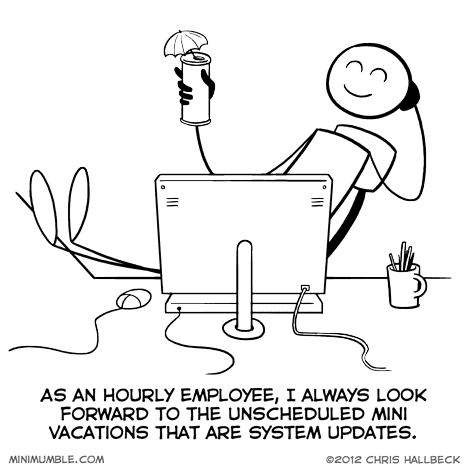 Generally the IT crew would schedule updates to happen overnight or on weekends. Occasionally though something would go wrong and an absolutely critical patch needs to be installed right now before you do anything else! Of course my machine was always at least 5 years old so trivial updates would take an hour or two. Time for doodles and comic writing! Ironically, that has been happening with my work computer every day this week. Here on The Great Plains, there are also the mini-vacations that start during thunderstorms. A flash, a crack of thunder, and whole sections of town go dark for a while. But, the building where I work was once a grocery store, and only has windows on one side. On more than one occasion, I’ve been in the restroom when the power goes out. Haven’t had to rescue customers in the dark, so far. Wow. You have enriched my life experience.